If you go bananas for…bananas, we don’t blame you. There was once a time when bananas simply adorned your fruit bowl, or got sliced on top of your cereal. Beyond that, it turns out that bananas carry all sorts of mind, body and beauty benefits, from fueling you through a workout, to helping you feel less stressed, to potentially lowering your risk of stroke. Bananas are exceptionally healthy as they provide numerous health benefits. It is a versatile fruit that contains many nutrients including vitamins A, B, C and E along with minerals like potassium, zinc, iron and manganese. Just as eating a banana helps in keeping your body in good health and great shape, application of this fruit on your hair and skin will help you to keep them in great condition. Bananas may have been the world’s first cultivated fruit. Archaeologists have found evidence of banana cultivation in New Guinea as far back as 8000 B.C. Bananas are produced mainly in tropical and subtropical areas of Africa, Asia and the Americas, as well as the Canary Islands and Australia. Bananas do not grow on trees. The banana plant is classified as an arborescent (tree-like) perennial herb, and the banana itself is considered a berry. The correct name for a bunch of bananas is a hand; a single banana is a finger. Nearly all the bananas sold in stores are cloned from just one variety, the Cavendish banana plant, originally native to Southeast Asia. The Cavendish replaced the Gros Michel after that variety was wiped out by fungus. The Gros Michel reportedly was bigger, had a longer shelf life and tasted better. The Cavendish may face the same fate as the Gros Michel within the next 20 years, botanists say. Bananas are also called plantains. But in general use, “banana” refers to the sweeter form of the fruit, which is often eaten uncooked, while “plantain” refers to a starchier fruit that is often cooked before eating. There are 50 recognized species of banana. Wild bananas grow throughout Southeast Asia, but most are inedible for humans, as they are studded with hard seeds. The vast majority of bananas grown today are for consumption by the farmers or the local community. Only 15 percent of the global production of the fruit is grown for export. India is the leading producer of bananas worldwide, accounting for 23 percent of the total banana production, though most of the Indian plantains are for domestic use. In 1923, sheet music for a popular song titled “Yes, We Have No Bananas!” sold upward of a thousand copies a day. Gives Instant Surge of Energy — It does this by converting the natural sugars into instant energy and this is one of the reasons sportsmen consume it during intervals. Bananas are an excellent breakfast for kids and adults as it provides required energy throughout the day. This probably the most popular health benefit of banana. Helps Keep Blood Pressure Under Control — Research indicates that potassium keeps blood pressure under control and improved consumption of calcium, potassium and magnesium can also help decrease high blood pressure. 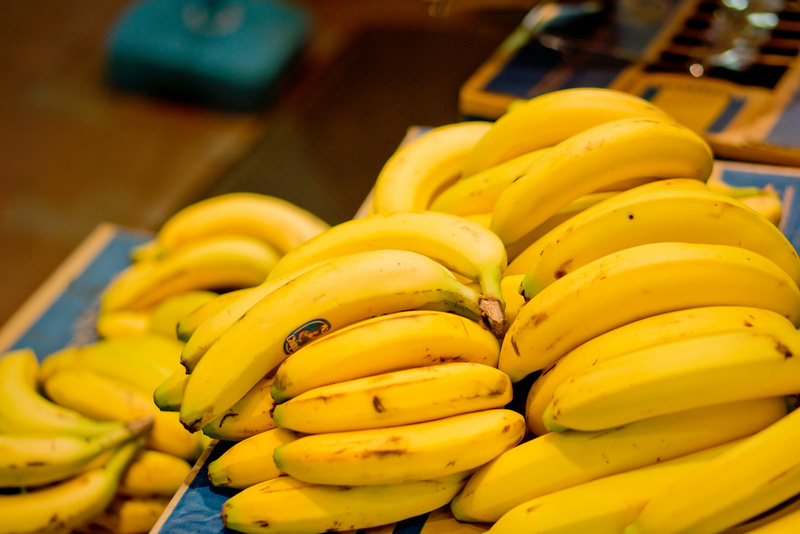 Bananas are rich in potassium, calcium & magnesium, so it is a healthy option for keeping blood pressure in check. Helps Lower Cholesterol — It is said that Pectin which is a soluble fibre in banana helps to lower Cholesterol levels. According to researchers, fibres that are water soluble such as pectin, psyllium, beta-glucan etc., lower the LDL Cholesterol without disturbing the HDL cholesterol. Supports Renal Health — Bananas being a rich source of potassium, if consumed regularly in moderation, promote renal health. The International Journal of Cancer states that Bananas being a rich source of antioxidant phenolic compounds, if consumed together with cabbage and root vegetables protect renal health. Improves Nerve Function and Enhances Brain Power — Banana is a rich source of B vitamins and therefore perks up nerve function. Potassium, in banana keeps the mental faculties vigilant and boosts learning abilities. Decreases The Risk of Stroke — Studies indicate that regular intake of bananas in daily diet helps reduce the occurrence of stroke and this is due to the high amount of potassium. Reduces the risk of Cancer — Rich in antioxidants and dietary fibre, consumption of bananas reduce risk of various types of cancer, especially bowel cancer. Helps Build healthy bones — Probiotic bacteria present in bananas is said to have astonishing ability to absorb calcium in the body. Hence, consuming bananas help in building better bones. Enhances Digestive ability — It is very rich in fructooligosaccharide which acts as a probiotic (friendly bacteria). It stimulates the growth and activity of probiotics in the colon and produces enzymes that enable absorption of nutrients thus enhancing the digestive ability and preventing unfriendly bacteria from harming the body. Helps combat Stomach Ulcers — Certain substances in bananas stimulate the cells which make up the stomach lining, this enables production of a thicker protective mucus barrier against stomach acids. Also the substance known as protease inhibitors in banana, help getting rid of bacteria in the stomach that produces stomach ulcers, thus protecting against damage of stomach and ulcer. Helps in controlling Diarrhea — Raw bananas are astringent in nature and are effective in treatment for diarrhoea. They also regulate fluid balance. Relieve from constipation — Pectin found in Bananas, help to alleviate constipation and improves bowel function. Helps regulating from anaemia — Bananas are good for Anaemic patients as they contain high levels of iron which help regulate the haemoglobin levels in the body. Prevents Allergies — The presence of benign amino acids in banana helps combat allergies. Enhance Weight Gain — The combination of milk and bananas enhances weight gain. Bananas provide the body with necessary natural sugars and milk provides protein. Bananas Benefits for Weight Loss –– Bananas contain loads of fibre and low amounts of fat and they are also easily digestible. A banana of 100 grams contains approx. 90 calories. And taking into consideration all its benefits it will not hurt including it into your diet. So dear weight watchers don’t eliminate banana from your diet completely. Prevents Insomnia — Bananas are rich in amino acids known as Tryptophan. This substance triggers production of melatonin (sleep hormone) which induces sleep. Eating banana a few hours before bedtime ensures a peaceful night’s sleep. Reduces Inflammation Due to Mosquito Bites — Itching and swelling caused by mosquito bites can be reduced by rubbing the inside of a banana on it. Other Benefits of Bananas: Bananas curbs morning sickness. Snacking on bananas at regular intervals helps preventing it. Vitamin B6, serotonin, tryptophan, dopamine, etc., in bananas help combat symptoms of PMS, erratic mood swings, and depression. I’m Dr. Malini Bhat MD (Ayu); an Ayurvedic Doctor and a health blogger. Follow me on social media to get daily health tips which you can easily adapt to a healthy lifestyle. Contact me for questions and queries related to medical field.